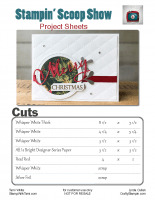 The new Stampin Up All is Bright Suite is a “mega suite” of coordinating holiday stamp sets, dies, apper and more. On this Stampin Scoop Show, we’ll do a full kit reveal of all of the products in this suite and share some fun alternate projects and prize patrol. Check out our fun card below, and download the free pdf for it with measurements and a supply list. Live is at noon EST today, and if you missed it (or want to re-watch) you can do that below. The “After Live” Drawing requires a comment on the video to enter. In order to enter, please leave a comment on the Stampin Scoop Episode 65 video on either YouTube or Facebook. If you share the video on Facebook (and type “Shared”) you will receive a 2nd entry. Love your video and projects!